Equifax acted recklessly and negligently. This affected me in many negative ways. Money won’t make it right, but it will help with some of the hassles I have already encountered and those I anticipate. as well as images which may have included driver’s licenses, passports, and social security numbers. Mine were among them. I am a freelance technologist, librarian, and small business owner in Vermont. 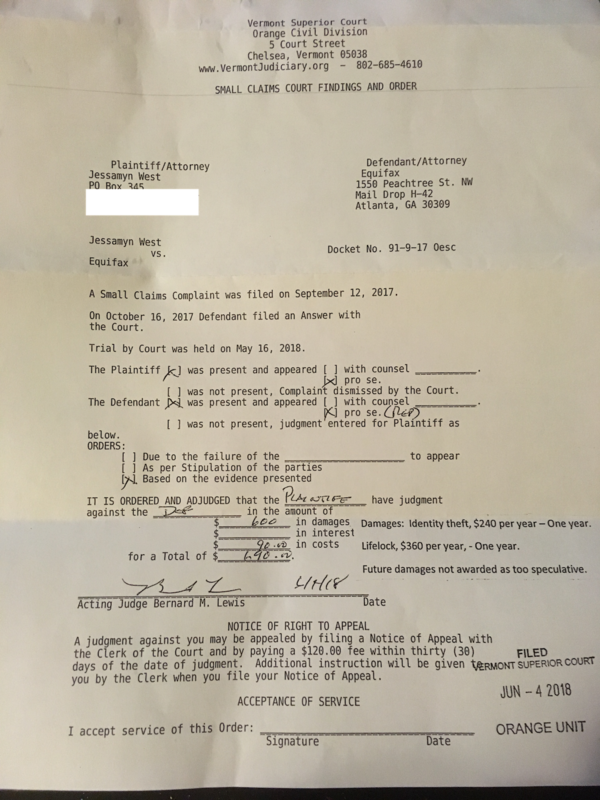 I filed this case on September 12. My mom died in late July 2017. This is, of course, not Equifax’s fault but the timing wasn’t great. It meant that right around the time of the data breach, I had to manage and transmit a lot of sensitive paperwork including my SSN, my sister’s SSN and my late mother’s SSN. I now own multiple investments with my sister whose financial life is combined with my own. I started two small businesses in 2017, one of which I own with several other people. I was unable to open a bank account with an online bank because my “challenge questions” answers (which go to “a credit bureau”) were not accepted. I could not set up a new inherited IRA account (while my sister could, with identical information) without providing additional information to the bank and when I asked why my account was flagged the banker just shrugged and said it had to do with “risk factors” and a score they got from the company that does risk assessment. I have an impeccable credit score. There is no way for me to tell if these or many other similar financial services hassles are due to the breach, but they have become more prevalent since last summer. I was on hold with Equifax’s understaffed support lines for hours. I tried to load their constantly-crashing websites for days. I am eternally vigilant about any change to my bank accounts, credit scores or even incoming postal junk mail. It’s exhausting. March 6–10th — Vulnerability reported, published in National Vulnerability Database on March 10th. Equifax also had a data breach in March but claims it’s unrelated to the major breach. May — July — Hackers gain access to data via a vulnerability in the Apache Struts software, used by the web server. Security experts call this “the highest level of risk that can be associated with a vulnerability.” Equifax has confirmed that attackers entered its system in mid-May through a web application vulnerability that had a patch available in March. According to PCIDDS standards (Payment Card Industry Data Security Standard — for anyone who holds credit card data, this includes Equifax who holds over 209,000 credit card numbers), all critical patches must be applied within 30 days (Equifax took 146). The vulnerability allows hackers access to the web server and then hackers gained additional access, over time, from there. This would not have been possible if many other good practices in data security — such as not giving excessive access to whoever “owned” the web services — had been followed. October 4 — 5 — CEO Smith testifies before Congress as “an unpaid advisor to the company” His testimony is where I got many of these facts from. Equifax’s social media arm tweets out a URL people can go to in order to verify if they’ve been affected but sent people to securityequifax2017.com, instead of equifaxsecurity2017.com. The wrong URL goes to a phishing site. They tweet it at least four times. PINs that were generated if you wanted to take advantage of a credit freeze via TrustedID were clearly a function of the data/time they were submitted: a freeze issued on September 8, 2017 at 2:15 p.m. generated the number 0908171415. This is not good practice. This is not secure. The data which hackers gained access to was unencrypted (plain text). This is not good practice. This is not secure. Equifax’s employees in Argentina manage credit report disputes via an online portal. This portal, in September, still had a default login/password combination of admin/admin. The passwords to employee accounts were in the web page codes in plain text. Anyone who complained or disputed Equifax’s credit reports had their information stored in this same database which included 14000 SSN equivalents in plain text. This is not good practice, this is not secure. PCI DSS (Payment Card Industry Data Security Standard) is an internationally accepted standard of controls which, when applied at the most basic levels, can reduce the risk of a breach and guide ongoing risk mitigation. Things like keeping financial information separate from billing etc. Equifax kept them all in one server. This is not good practice, this is not secure. This is not the first go-round for Equifax. They run another company called TALX which does payroll services and was alerted that people were getting unauthorized access to people’s W-2s and other information over a period of nearly a year between April 2016 and March 2017. People’s private information was protected by a four digit PIN. This is not good practice, this is not secure. Equifax’s chief security officer Susan Mauldin who also retired in September studied music composition in college and had no security degree. This is well outside of industry standard practices. By all accounts, a single person was responsible for patching the software vulnerability and there was no oversight into whether that person had done their job. This is not good practice, this is not secure. Vermont’s Security Breach Notification Act requires that a “data collector” must notify the Attorney General within 14 days of notice or discovery of a breach. Consumers need to be notified within 45 days. Consumers were notified within 40 days. To the best of my knowledge the Attorney General was not notified any sooner. Vermont’s Social Security Number Protection Act requires treatment of SSNs in more secure ways (encryption especially for transmission) than Equifax employed. There are three consumer credit bureaus in addition to Equifax. Experian, Innovis and Trans Union. Freezing credit is somewhat complicated and puts the burden for security on the consumer. Equifax has also set up a “shadow credit reporting agency” called National Consumer Telecommunications and Utilities Exchange (NCTUE) in which data of people who have credit freezes on their account can still be accessed. Equifax is the sole contractor. The site is being served with an invalid certificate, making it inaccessible via Google Chrome (the company made this change in April 2017, this is not a new thing), one of the most popular web browsers. Equifax also runs a salary verification service called The Work Number which requires a separate freeze/opt-out. Security experts call Equifax and their legacy of poor security and incident response “digital dinosaurs” and I do not want to have any more interactions with them than ones that are strictly necessary. I argue their conduct goes beyond just being lazy or shoddy but heads over into recklessness and negligence. The multiplier effect of that negligence is causing low-level constant harassment via small “Not sure if this is Equifax’s fault or something else” indignities in my financial life that I anticipate continuing to follow me for years. I would like Equifax to provide me money for these monitoring services for myself, my sister, and my jointly-owned business, for five years, not the one they have offered with their own in-house monitoring. A low end cost of $3600. I would like Equifax to reimburse me for court, travel, and reproduction costs of $250. The tl;dr is that this all really hinged on the idea of “speculative damages” (i.e. I was asking for money I would have to spend in the future, not money I’ve already spent). In a small claims case, your time and hassle are worth basically zero. The judge tried to help me along, but I haven’t really spent a lot of actual cash on this other than court costs. So while there was no right-then decision and the judge was going to wander off and research some things, it didn’t really look like it was going to go my way. Which, to be honest, was about what I was expecting. I maybe could have documented some more stuff, I could have started paying for credit monitoring beforehand on spec, I guess. I’m pretty happy overall with how this went. Their lawyer (a paralegal really) was a decent, honest person who got an all-expense paid trip to Vermont in the height of springtime. I spent a few hours here and there assembling my case and got to take a write-offable trip to one of my favorite adorable courthouses and had a good story to tell. If you like to read in Twitter-thread format, you can do that.